Promotional Logo Light Up LED Flashing Sunglasses are coming with features like CPSIA compliant, one size fits most and also 3 replaceable AG3 batteries included. You can do a superb promotion using these custom party sunglasses as they have 3 LED function to attract the attention of the people quickly. Steady, slow flashing and quick flashing are those multiple LED functions. Brand launches, celebrations and success parties are all ideal occasions to use these custom sunglasses. 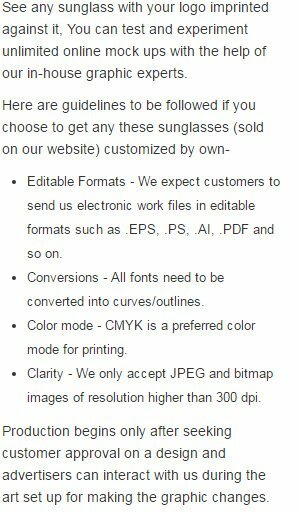 Order these sunglasses with an imprint area of 2" x .3" quickly to get free online proofs and free artwork design services. Request a quote to know the value savings that you can avail on bulk orders of Promotional Logo Light Up LED Flashing Sunglasses.